SATO RACING Rear Sets [BLACK] for 2017-19 Kawasaki Ninja 650 / Z650 is a track-engineered design that provides 6 adjustable positions, bringing your feet significantly higher up and further back compared to stock, for a more aggressive riding position that is well-suited to the fast straights and steep lean angles encountered on the track. 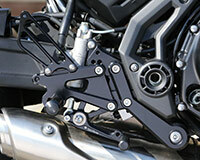 These premium Rear Sets are CNC-machined from high strength billet aluminum, with a deep Black anodized finish. The shift and brake pedals utilize miniature double >stainless bearings for smooth. precise lever movement. Knurled foot pegs provide optimal grip, along with a comfortable, intuitive feel. Fully compatible with the stock brake light pull switch and ABS. Provides a stock shift pattern. NOTE: SATO RACING Rear Sets are designed for track use. We highly recommend installation be done by a certified mechanic.